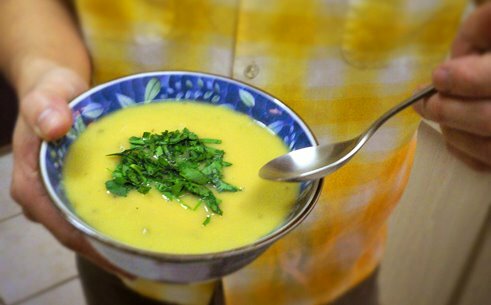 My grandmother used to make cream of celery soup -- I always think of her when I get the craving for it. She never left me her recipe so this is my rendition. I like it with toast or a slice of vegetable pie on the side. Serves 4. Heat oil or ghee in a soup pot, and add onion. Saute for a few minutes til they start to soften. Add celery, potato and garlic, and saute 5 minutes. Sprinkle with flour and seasoning and stir to combine well. Add broth, bring to a boil, then simmer to a slow bubble for at least half an hour. Transfer some or all of the soup to a blender (depending on if you like a chunky or silky smooth soup) and puree. Serve garnished with cilantro, parsley or lemon. Vatas can also add a dab of ghee. According to Ayurveda, cooking different ingredients together in a soup or stew makes the food easier to digest. This is because the vegetables, beans or legumes affect each other and take on each other's unique properties, making them harmonious in your belly instead of each having opposing qualities. All flavours of sweet, salty, pungent, sour and bitter combine in the pot so your system has less work to do, but reaps all the benefits of each ingredient. Claudia...I made this soup on the weekend...delicious. Really nice and creamy. I used a pinch of ginger and it had a good little kick to it too! Thanks for sharing. Noooo...i'm a Pitta...uh oh...was I not supposed to use ginger? But I really it! exactly..and what I meant to write was that I really love ginger (and all the other spices you listed)...of course we love what we shouldn't have. Thanks for the info. I'll be checking out more of your recipes and words of wisdom for sure.